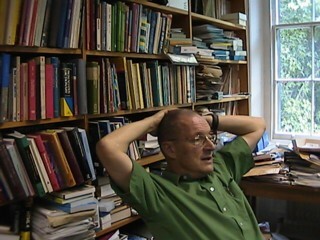 Jérôme Poirrier has sprung to the defence of the LDOCE double-decker symbols (blog, 11 August). I feel the urge to express my personal history with the double-decker signs: when I bought the Longman Dictionary of Contemporary English, I liked the double-decker symbols immediately. I'd like to tell you how these symbols were beneficial to my perception of the English language and why their meaning was crystal-clear to me, a lot more than some other conventions. 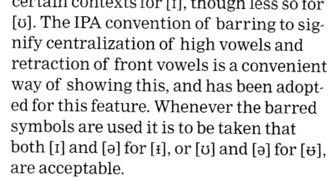 Thanks to the choice made by the makers of LDOCE, I had an epiphany, which is very well summed up by your very words «For EFL, it certainly DOESN’T MATTER which of the two vowel qualities you use». Indeed, until then, I had always thought of foreign languages as monoliths with only one acceptable pronunciation, and for which every phonetic bit mattered. The double-decker sign was instrumental in opening my eyes on the acceptability of some variations inside the targeted language. Why the double-decker sign's meaning was transparent to me: [and he goes on to refer to graphic representations in mathematics]. He tells me that he has invented a number of further double-decker symbols for his own use: iɪ for the happY vowel, æɑː for the BATH set, ɒɔː for the CLOTH set, orɔː for the FORCE set, and θð for the final consonant in with. I can see that one might extend this notational convention further, e.g. by writing iːaɪ for the first vowel in either and neither, eeɪ for the second vowel of again, against and ate, and indeed many more. Seven as ˈsevn̩ən? How about baths as bɑːæθsðz? I don’t think so. You can do what you prefer in your own notes, Jérôme. But this is not the way for lexicographers to go. Recently there have been several mentions of a company called Persimmon, ‘one of the UK’s leading house builders’. This name derives from a common noun denoting a kind of fruit (now sometimes sold in supermarkets under the name “Sharon fruit”), and according to all the reference books is pronounced with penultimate stress, pə(r)ˈsɪmən. That is indeed what I say myself. But several times on radio and TV recently I have heard the company referred to as initial-stressed ˈpɜːsɪmən. The former building society Abbey National, now a bank, has been taken over by the Spanish bank Banco Santander. Santander is the name of a city in northern Spain, Spanish santanˈder. Although in English it looks at first sight as if it should be sænˈtændə, most of us know by now that it is correctly pronounced with final stress, thus (anglicized) ˌsæntænˈdeə. But what about the vowels? On the radio I heard a banker repeatedly refer to it as ˌsɒntænˈdeə or ˌsɒ̃tænˈdeə, i.e. with the first syllable (but not the second) pronounced in accordance with the spelling-to-sound rules of French. Strange. Perhaps he’d drunk too much Sancerre. There are two issues that arise in anglicizing the name: what to do with the first vowel and what to do with the last one. Probably more usual among English-speaking people in general is ˌetɪˈhæd. Given the spelling E-, it is counterintuitive for English-speakers to pronounce it with ɪ. Arabic has only three contrastive vowels, though each can be either short or long, and apparently the transliteration e is sometimes used to make it clear that the /i/ vowel is short. The last vowel is long in Arabic, although there is nothing in the ordinary spelling Etihad to show this, which leads English speakers to tend to pronounce it short. The h, as you see from the transliteration and transcription above, is in Arabic pharyngeal. But we can’t do pharyngeals in English. Perhaps an acceptable compromise anglicization would be ˌetɪˈhɑːd. I wonder what the airline’s non-Arabic cabin staff and officers actually say. This is a follow-on to my blog of 7 July, Jumieka langgwij. An experiment is now in progress in a number of primary schools in Jamaica. The children are first taught in ‘patois’ (Creole) for a year or two, before being introduced to Standard English. The hope is that teaching them literacy first of all in their (true) mother tongue, and then systematically analysing the differences between Creole and English, will enable the children to end up with a higher level of achievement than hitherto, and in particular to leave school literate rather than semi-literate or illiterate. The orthography used for the Creole is a slightly revised form of Cassidy’s transcription in the Dictionary of Jamaican English. 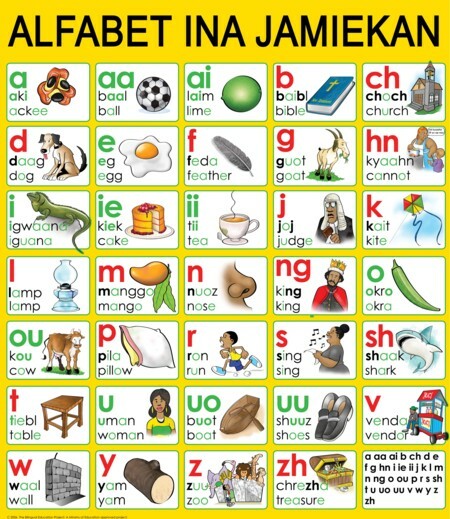 My thanks to Rocky Meade of the UWI for sending me this image of a poster setting out the JC alphabet for use in primary schools. As you can see, some people spell the Jamaican for ‘Jamaican’ as Jumiekan, others as Jamiekan. Given that the orthography is phonemic, it was a wise decision to allow spelling variation wherever there is variation in usage. This applies in grammar, too, where the anterior (‘before-now’) tense marker can be written as any of ben, behn, men, mehn, en, ehn, did and the progressive (‘ongoing-action’) aspect marker as da, a or de. a wa ben de krai so laas nait? a wa en a krai so laas nait? As well as the Jumieka Langwij site that I linked to on 7 July, there is more formal and technical coverage on the website of the university’s Jamaican Language Unit. As we know, native speakers of Standard English often find it quite difficult to transcribe their own speech phonetically. We have to drill them repeatedly to get them to analyse sounds accurately and to avoid the dazzling effect of standard spelling. I think the same problem may affect those who want to write creole, too. Unless they’re properly trained, they make mistakes. Even for native Creole speakers, using the newly sanctioned orthography may be problematic. To show you what I mean, here is a sample passage from the Bible in Creole that I found here (scroll right down to the entry for 11 March 2007). Nou, mi a aks yu, mi liedi, fi mek wi lov wan anada. A no even fi seh dat mi a rait yu bout somting nue, kaaz a laang taim nou wi get dis ya komaanment ya. And in Westmoreland, at least, di piipl dem naa se aks (ask), dem a se aaks. I was going to write about Radovan Karadžić (Cyrillic: Караџић) and the strange tendency for British newsreaders to call him ˈkærədɪtʃ, but I see that Graham Pointon has beaten me to it (his blog for 24 July). On CNN the other day, though, I heard an American reporter speak of ˌʃeʃˈwɑːn. You can see how the spelling might produce this — if we give sz its Polish value and ch its French value. For the new spelling Sichuan, OBGP recommends səˈtʃwæn, though in LPD I give ˌsɪtʃˈwɑːn. In tone-marked Hanyu Pinyin it is written Sìchuān. The Mandarin pronunciation is 4sɯ 1ʈʂʰwan, where the symbol ɯ represents an alveolar approximant with back unrounded resonance [zɯ] or an alveolarized back unrounded vowel [ɯz] (see previous discussions in this blog; the sinologists’ phonetic symbol — not recognized by the IPA — for this unusual vowel is ɿ). The written form of its name consists of the character for ‘four’, 四, followed by the character for ‘river’, 川. So the meaning is the straightforward ‘four rivers’. The Longman Dictionary of Contemporary English uses two special double-decker phonetic symbols. I wonder how sensible it was to invent these edifices. As with all abbreviatory conventions, you have to balance out the advantage of being concise and precise against the disadvantage of confronting the dictionary user with a symbol whose meaning may not be entirely clear. Given that users often don’t bother to read the explanations given at the front of the book, an abbreviatory convention needs as far as possible to be transparent. One further disadvantage is that these double deckers are not covered by Unicode and not available in any public font. So you can’t word-process them or include them in your Powerpoint display. Indeed, if I want to reproduce them here in the text, rather as images, I am forced back on ɪə and ʊə, superscripting the first and subscripting the second character in each case but unable to stack them vertically. The Oxford Dictionary of Pronunciation uses a different convention to achieve the same result, namely barred-ɪ and barred-ʊ. I find the explanation in the forematter to be pretty user-unfriendly, and the results in the body of the dictionary difficult to read. The other possibility is to spell out the two possibilities in each case, as I do in LPD. This takes more space, but has the great advantage of enabling me to prioritize the choices. I find I want to divide the words in which LDOCE uses ɪə into two classes. 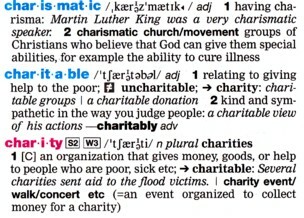 Group 1 includes words with the suffixes -ity, -ness, and weak -ate (charity, goodness, moderately). In these I want to prioritize ə. Group 2 includes words with the suffixes -ed, -es (-’s), -et, -id, -ify, -is, -it, -itude (wicked, riches, cricket, rapid, signify, crisis, rabbit, attitude). In these I want to prioritize ɪ.
Daniel Jones would have used ɪ in all these cases. Perhaps you have different preferences or prejudices, too. For EFL, it certainly doesn’t matter which of the two vowel qualities you use. Thanks to Alison Keable for drawing my attention to a series of sketches by Alexander Amstrong and Ben Miller, “WWII RAF”. They are taken from the BBC One television show Armstrong & Miller, shown in 2007-2008. Here is the first one. There are subsequent ones here and here (and there are more). The comedy in these sketches arises from the fact that the two stereotypical stiff-upper-lip pipe-smoking Royal Air Force pilots from the second world war speak in the now dated upper-class RP of the 1940s while using wording and grammar that belongs to the Caribbean-influenced street slang of today’s working-class urban teenagers. The content is sixty-odd years out of sync with the pronunciation. Although the phonetic segments are 1940, the intonation includes the “uptalk” that has become fashionable (among young people) only in the last decade or two, yeah? So this is me: it’s a well funny sketch, know what I mean? Before my visit to Cayenne I had barely heard of the language Ndjuka (also Ndyuka, Djuka; Ethnologue calls it Aukan, properly the name of its main dialect). Most of its speakers live in Suriname, but there are also some in French Guiana. Like Saramaccan, Ndjuka is an English-lexicon Creole spoken by Maroons (aka Bush Negroes) whose ancestors were shipped as slaves to Suriname over three hundred years ago to work on English colonial plantations. Those who managed to escape fled deep into the rain forest, where they established communities along rivers in eastern Suriname and parts of neighbouring French Guiana. Unlike the English-lexicon Caribbean creoles such as Jamaican and Trinidadian, spoken in what were until less than fifty years ago British colonies, Ndjuka and Saramaccan have been entirely out of contact with standard English for centuries. So whereas Jamaican Creole is spoken in a diglossic continuum extending from basilectal deep Creole to acrolectal Jamaican Standard English, Ndjuka is a free-standing language exhibiting approximately zero mutual intelligibility with English. As in many sub-Saharan African languages, but not English, Ndjuka syllable structure allows for initial clusters of nasal plus plosive, as in the name of the language ndjuká and the word for ‘snail’, ŋkólá. The clusters kw, gw are alternatively pronounced as double-articulated k͡p, g͡b, thus gbé from English go away. Double articulation of plosives is a familiar feature of West African languages, as in the language name Igbo (Ibo). Ndjuka is a tone language. There is a minimal pair na ‘is’ vs. ná ‘isn’t’. Vowel length is also distinctive. While báká means ‘back’, bákáa means ‘white man’ (compare Jamaican backra), and baáká means ‘black’. There’s an article by George and Mary Huttar on the phonology of the language here. 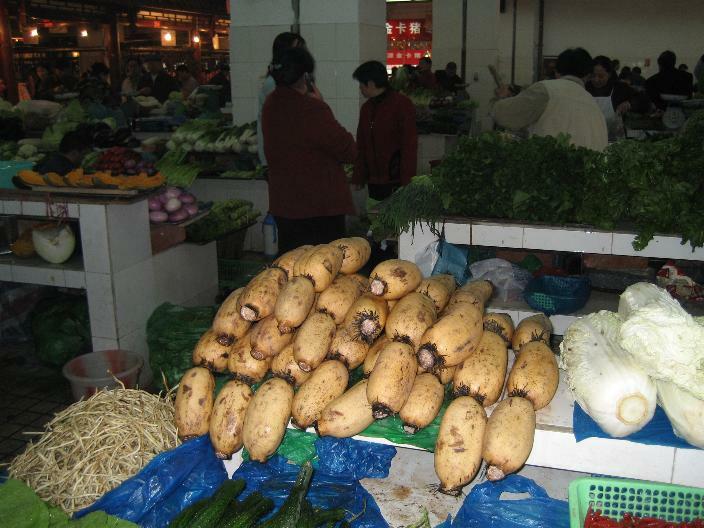 Words of obviously English origin include fátú ‘fat’, bígí ‘big’, mófó ‘mouth’, tífí ‘tooth’, tápú ‘stop’, sinékí ‘snake’. Ndjuka has its own script, the Afaka script, a syllabary of 56 letters devised in 1908 and named after its inventor, Afáka Atumisi. It continues to be used today to write Ndjuka, or is now largely abandoned (depending on which source you believe). Afaka is claimed to be the only script in use that was designed specifically for a creole. It is not supported by Unicode. According to Wikipedia the literacy rate in Ndjuka for all scripts is less than ten percent. In yesterday’s blog I praised two of the speakers at the Cayenne conference. Unfortunately, as at many conferences, there were other speakers who were not so good. It’s not that what they said wasn’t interesting or important: it’s that their presentation technique was so abysmal. Time after time a speaker would start Good morning — um — and the whole talk would be punctuated with distracting hesitation noises. Some speakers did not know how to use a microphone, with the result that they were largely inaudible. Some struggled with their Powerpoint or OHP displays, crowding too much material onto a single frame or displaying a frame for such a short time that the audience could not take it in. Some had problems with pacing, so that when the chair warned them that time was nearly up they had still not got to their main point. Some made no eye contact with the audience, and were thus impervious to body-language feedback. I really wonder how some of these people can function as professional lecturers and teachers. I think that we phoneticians can in general congratulate ourselves on being good public speakers. If only that were true of everyone who speaks in public! I’ve just come back from Cayenne in French Guiana, where I attended the conference hosted jointly by the Society for Caribbean Linguistics and the Society for Pidgin and Creole Linguistics. It was interesting and stimulating, exactly the way an academic conference should be. Now I have a whole list of things I want to look up, read, or do, and I have made some good new contacts. The proceedings got off to a slightly controversial start: in a plenary lecture entitled An Overview of Amazonian Languages, the anthropologist/linguist Francesc Queixalós spoke slightingly of North American protestant missionaries who according to him are destroying the cultures of the indigenous peoples. This naturally upset several SIL people who were present, and who argued that on the contrary they work for the preservation of indigenous languages by teaching the speakers of those languages to read and write them. It is claimed that there are some thirty different languages spoken natively in Guiane Française (French Guiana). The official language is of course standard French, and English does not feature at all highly in the locals’ linguistic repertoire. As I gave my hotel room number to the waitress at breakfast, it occurred to me that if I had demanded of my UCL students that they pronounce as a nonsense word døsɑ̃vɛ̃ttʁwɑ (the number 223 in French; d, t dental), they might well have complained that it was too difficult, too full of exotic sounds.